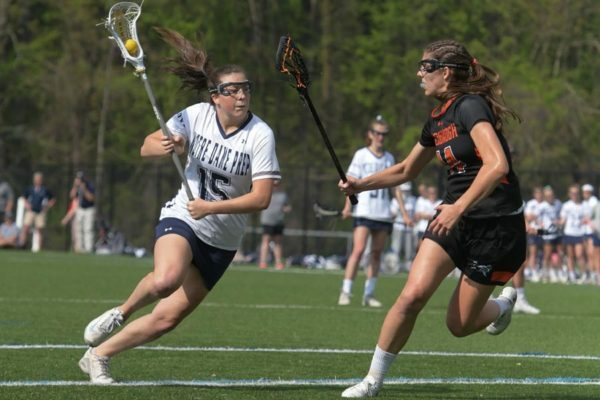 TOWSON – It’s not unusual for Notre Dame Preparatory School to graduate an impressive number of student-athletes who take their academic and athletic excellence to the next level. And then there is the NDP lacrosse team, which alone has set quite a standard in 2017. The Blazers take an 18-2 overall record into the Interscholastic Athletic Association of Maryland A Conference playoffs as the No. 2 seed, led by a 16-member senior class that has been equally strong in the classroom. Each graduating lacrosse player at NDP will continue her lacrosse career at either a Division I or Division III school. Several were among the 18 Blazers – each eligible member of the roster – who earned recognition on the National Field Hockey Coaches Association’s National Academic Squad last fall. One of those seniors is goalie Lucy Lowe, who will play lacrosse at Penn State. She can remember a time when she barely understood how to juggle a packed daily schedule, but Lowe says she learned the invaluable skill of time management at NDP, a National Blue Ribbon School in 2012 which challenges its students with a rigorous, three-part mission. That includes an academic foundation, a spiritual component encouraging students to live faith-filled lives, and a requirement that students affect the lives of others by completing at least 80 hours of community service. “This school has taught us how we should handle ourselves and how we should treat others,” Lowe said. “Playing sports has really helped me to learn time management. “I’m at lacrosse practice every day after school and have games on the weekends. By the time I get home during the week, it might be 7:30, and I’m exhausted. I just want to get my homework done and go to bed. Mac Ford, the third-year coach at NDP, marvels at the way his seniors have balanced their busy schedules, while putting together by far the best season of his tenure. The Blazers have beaten St. Stephens-St. Agnes from Alexandria, Va., then second-ranked team in the U.S. 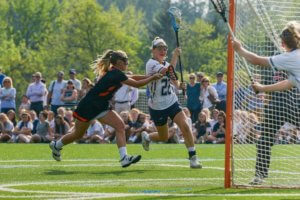 They also have defeated Mount Sinai, the defending New York state champion, as well as elite squads such as Philadelphia’s Episcopal Academy and Ontario’s Hill Academy. They open the A Conference playoffs at home May 9, against Bryn Mawr. It’s been another good athletic year at NDP. The school won its second IAAM volleyball title in three seasons. The swimming team is the National Catholic Champion for the second time in three years. The soccer team was conference runner-up for the third straight year and finished No. 25 in the nation. The field hockey team was conference runner up last fall. 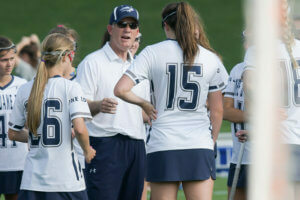 James Smith, the school’s fifth-year athletics director, says the lacrosse team provides a prime example of what makes his job so satisfying. And it goes beyond watching a lacrosse team that, on his watch, is sending an unprecedented number of students to play at the collegiate level. “The students and faculty really care about each other, and you feel that every day,” Smith said. “You’re reminded of the mission every day, whether it’s prayer at morning announcements or the end of the day, or the academic mission that is straightforward, or when (the girls) serve meals (to the needy). The following seniors at Notre Dame Preparatory School have signed national Letters of Intent to play athletics at the NCAA Division I level. Gary Lambrecht is a freelance writer for the Catholic Review.